Since our founding in 2010, Capital Institute and our collaborative network have been on a learning journey…searching for a path that would lead us beyond our current unsustainable economic system and the finance-dominated ideology that drives it. What we discovered was a new way of thinking about economics and how we manage our free enterprise system, aligned with our scientific understand of how the universe actually works and with our shared values. In April 2015, we released a white paper with our findings and called this framework, "Regenerative Capitalism." Regenerative Capitalism is a natural evolution of capitalism that embodies a deeper purpose than merely optimizing financial returns, with the goal of promoting the long-term health and well-being of our human communities and the planet. The framework is defined by eight principles: In Right Relationship; Views Wealth Holistically; Innovative, Adaptive, Responsive; Empowered Participation; Honors Community & Place; Edge Effect Abundance; Circulatory Flow; and Seeks Balance. 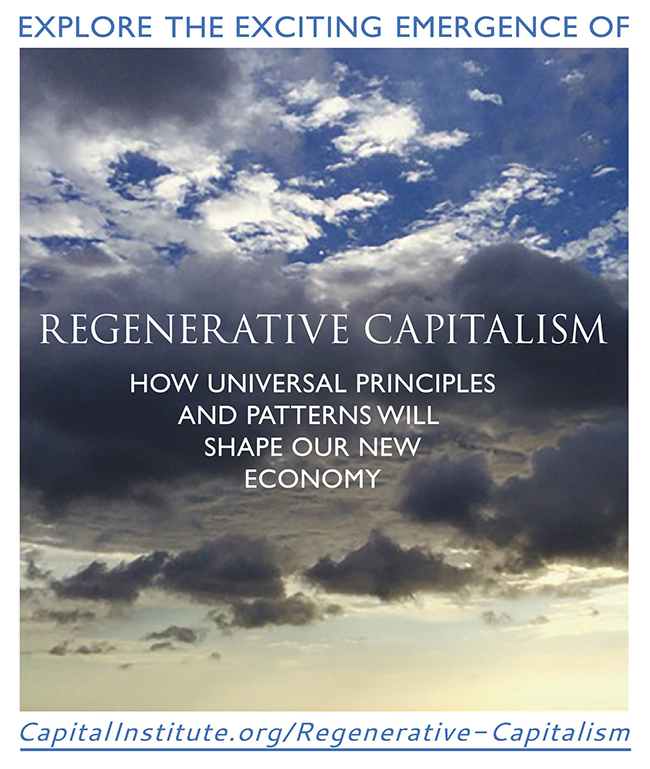 To learn more about the Regenerative Capitalism framework, please click here.